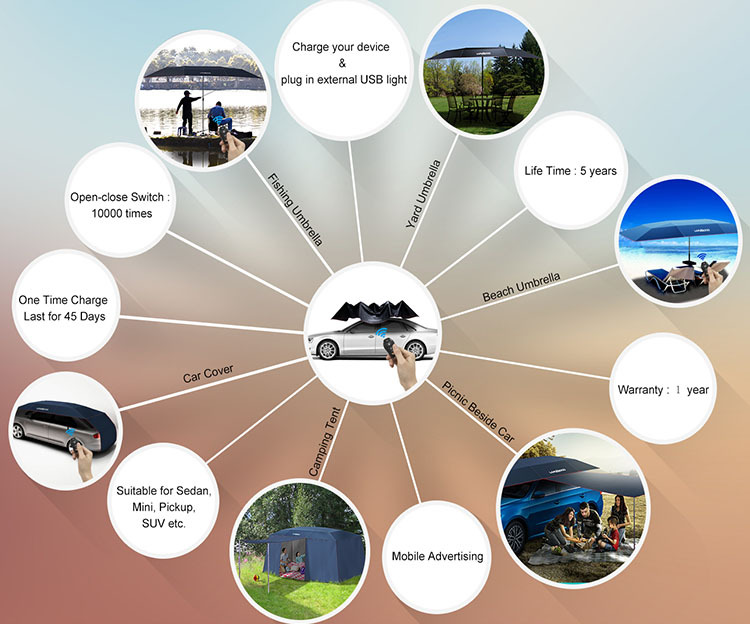 Lanmodo car umbrella is an all-in-one automatic car umbrella built to serve as transformer to fishing umbrella and beach umbrella as well as LED camping car tent and lots more. You should not bother yourself with complicated tent for car that is difficult to set up. That is why you need to go for the Lanmodo automatic car tent. Just with one-touch wireless control you will be able to set up the tent. The folding and unfolding of this umbrella is done automatically with a touch on remote control. That is the reason you have to ensure that you consider going for the number one all-in-one Lanmodo auto tent on car. Reduce overall temperature of a car up to 36°C. That means you will not need to worry about increase in temperature due to sunshine in your environment. In fact, with the help of Lanmodo car umbrella over your car, you will not suffer discomfort cause by increase in temperature. The temperature of your car will be reduced with up to 36°C when you make use of this wonderful automatic umbrella. Great car protection irrespective of season. So, whether summer, winter, spring or fall you will be sure of absolute protection over your car. Another thing about this tent is that it can protect car from leaves. So, you can park your car under tree shade without having to worry about leaves falling over your car. In fact, dust, snow, falling objects, bird droppings and even hail will never be your problem when you make use of this latest improved car tent. That made it suitable for any kind of use and environments. You can even use it in camping ground and other outdoor places. Easy installation with automatic remote control that will make it easy for anyone to get it installed with a press on a button. When it comes to time taken to install this umbrella, it does take just 8 seconds to unfold it and 30 seconds for full installation. That means you will no longer waste your precious time to make use of the tent at any point in time. Suitable in different models of car. Your model of car is never a problem when it comes to this car tent. So, whether you are using small car, mini bus, jeep and others, you will be sure of total cover with Lanmodo car cover. Portable meaning that it can easily be carried around without difficulty. You can just fold it and keep inside your car trunk without taking up much space. Lanmodo car tent is bespoke as mobile advertisement or gift to users. So, you can even advertise your brand on the umbrella and be sure of great popularity. There are so many car umbrellas in the market today with manual control. Using such umbrella can be complex and tiring due to manual installation and removal. The lanmodo auto car tent has been transformed into an automatic outdoor umbrella. It is now built with additional stand. In that regard, they are made perfect for different uses including as fishing umbrella, beach umbrella and others. When you want to go for outdoor enjoyment with your family, you will be sure of safety to your car and family members. Just embark on fishing with Lanmodo car umbrella and you will not have to worry about any kind of issues on your car. Lots of features have been added to this wonderful car tent to make your day and night fishing and remarkable adventure. It is built with USB port where you can easily connect your USB lights for wonderful night fishing experience. If you are thinking of embarking on camping you should consider getting Lanmodo car tent. It is an all-in-one tent built with additional stand as well as canopies. You will enjoy great experience with this camping car umbrella. Installation is easy and takes only few minutes. What you just to do is to buckle up the double-buckles, pull the zippers to link the inside of the canopies to each other and the camping house is ready. Your entire family members can easily be accommodated inside the camping umbrella. This is due to the fact that the newly improved umbrella is built with additional space to accommodate up to seven people. Apart from covering, the Lanmodo car tent can also be used as movie screen due to the silver coating. So, you will be able to make use of the canopies for several other things apart from providing your car with cover it requires. Covers entire car including the front and back.